@dylanmtaylor: good suggestion. I see no reason to keep the "Uninstall CrossOver Linux" shortcut. Will remove that in the next update. Any chance you could remove the "Uninstall CrossOver Linux" shortcut since you'd want to do that with the package manager anyways? @mya711: lib32-nss-mdns is already included as an optional dependency for x86_64 and crossover in most cases runs just fine without it. So I see no reason the include it as an required dependency. Please keep in mind right now installing crossover is fairly easy and quick since it does not have a hard dependency on annother AUR package and I intend on keeping it that way. Installing lib32-nss-mdns does solve the problem. However the next package update would benefit from including lib32-nss-mdns as a dependency. @fhk1407: I guess you are running a 64bit Arch. So you need to install the lib32-nss-mdns package from the AUR. Crossover complains: Some errors may prevent CrossOver Linux from working correctly: * Missing 32bit libnss_mdns.so.2 library. Running pacman -Syu nss-mdns doesn't fix it. What gives? Updated crossover to 18.1.0. Took me a little longer than usual since I have been AFK for a few days. @traffic-light: thanks for posting hints for updating crossover including the change to the pkgsums. 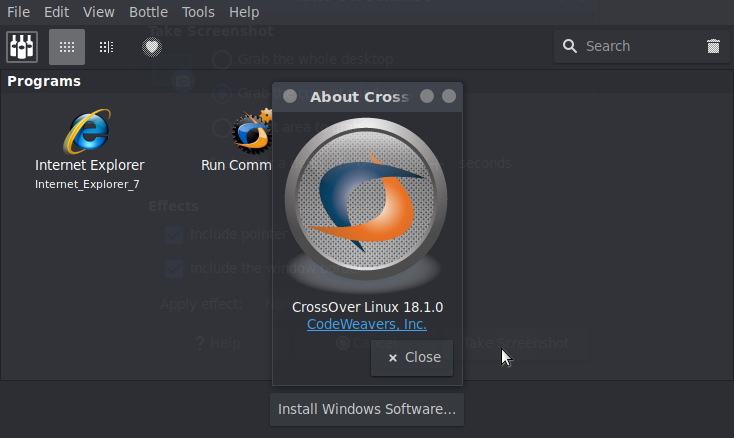 There is a new version for crossover (18.1.0).